Most of us have that "one person" in our lives, that individual who seems pathologically incapable of keeping their hardware free of electronic miscreants for more than a week. No matter how many times you remind them not to click on those "You have just won the Brooklyn Bridge" ads, they just keep going back like bloatware-loving lemmings. It's infuriating and it's the reason why you should fund Jumpshot on Kickstarter. Described as a "fully automated solution for solving PC frustration," Jumpshot from Tulane University Computer Science graduates David Endler and Pedram Amimi is apparently going to be the Swiss Army Knife of PC support people everywhere. Jumpshot comes on a USB stick that runs a customized version of Linux, and not only will it aim to wipe away viruses, spyware, and bloatware, if it works as advertised, Jumpshot will automatically load the correct drivers for your PC and learn from its interactions with you. Now, I don't know about you but I would have handed them my $5 for that alone., It looks like the dynamic duo behind Jumpshot weren't just satisfied with the idea of being useful, though; they wanted to be marketable as well. A portion of the $25,000 that they're asking for on Kickstarter will go toward the production of their line of tooth-achingly cute USB sticks--something that will help set them even further apart from the competition. Seriously, folks. If you're looking to fund something on Kickstarter, it should probably be Jumpshot. Why? Because we don't really need more gaming peripherals, but we do need cleaner, healthier PCs. 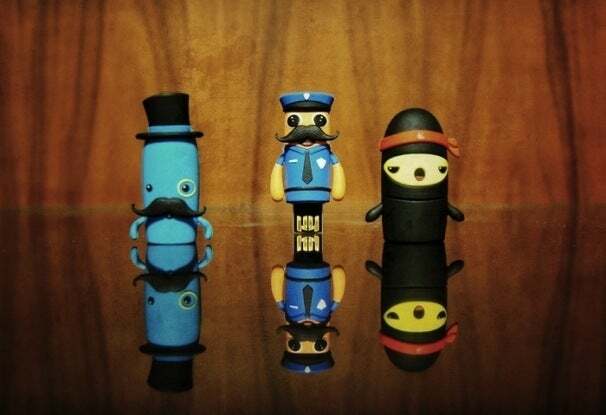 Besides, who doesn't want a top-hat-wearing, monocled USB stick?